PARIS — A man pulls a piano behind his bike as he rides past a sidewalk still stained by streaks of blood near the Bataclan concert hall in the 11th arrondissement. He stops to play. The tune is fitting: “Imagine,” by John Lennon. It was here, mere hours ago, where dozens of people were shot dead. But today on the streets of Paris, along with feelings of shock, horror, and fear, there was also one of unity, in defiance of the terror the night before. For Parisians, 2015 started with the January mass killings at the office of satirical magazine Charlie Hebdo and at a kosher supermarket. The year now nears a close amid even worse bloodshed, as terrorists staged six separate attacks that killed at least 129 and wounded 300 people — 80 remain in critical condition. Targets included the Bataclan concert hall — where the California band Eagles of Death Metal played — Paris’s main soccer stadium north of Paris, Stade de France; and a popular Cambodian restaurant in the 10th arrondissement (district). 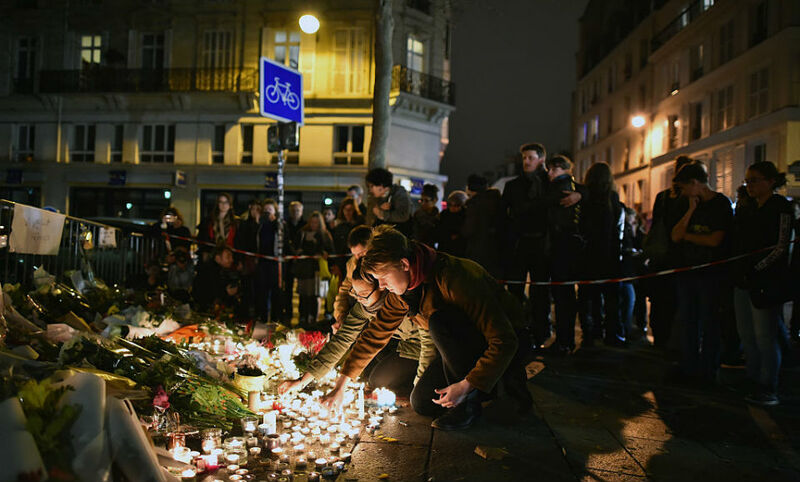 As Paris once again reels in the face of terrorism, the same questions are coming up anew. Is it safe to go about one’s daily business, Parisians are asking — to shop, eat at restaurants, walk on the street, go to a concert? What about the further stigmatization of France’s Muslim population, the largest in Europe at an estimated 6 million people? And what about the boost such attacks give to the xenophobic National Front party? French President François Hollande, who was evacuated from the Stade de France, which was hosting a friendly match between France and Germany while the crisis broke out, declared a national emergency. His speech on Saturday, Nov. 14, seemed to augur a stepped-up war against the Islamic State, which he accused of orchestrating the attack. Paris went on lockdown Friday after the attacks, with some Métro stations shut down and streets blocked off. On Saturday, schools, museums, and cinemas remained closed; events were canceled; some stores didn’t open; and fewer people were visible on the street. And some in Paris said their sense of safety is shattered, probably forever. Nathalie, 50, lives on the Square Voltaire, near the Bataclan, and said she heard the gunshots and the sirens while home with her family. She said she can’t barricade her three children at home, but feels like they will need to be more careful in the future because she anticipates more attacks. Many Parisians interviewed said they wish France would become more isolationist. The Islamic State said that the attack was “just the beginning” of retaliation against France for its offensive against the group in Iraq and more recently in Syria. Romain Caillet, a Paris-based expert on jihadi movements, said that this is likely to be true. “Relatively speaking, France has less jihadists in Syria and Iraq than other countries like Belgium and the United Kingdom, but it remains more symbolic to hit France,” he said. That sentiment has led some Parisians to feel under siege. Others say it is time for a re-examination of French foreign policy. Still, many locals, even as they voiced fears and concerns, said they were struck by how French society opened up to take in people in need. Taxi drivers eschewed fares. Neighbors rushed out onto the street to help victims. And people opened their doors to those stranded and unable to get home. “I have a home in 18th, I speak english and french,” tweeted Sarah Colucci, 19, a student and one of the many Parisians who posted an offer of aid onto social media using the hashtag #PorteOuverte (“Open Door”) on Friday.